As part of my job as a yoga educator I was asked to write mini-profiles on several teachers. This is one I wrote about Sara Boggess, Pittsburgh Public PE Teacher. Sara was not brand new to yoga. She had already been practicing on her own and even incorporating it into her classes. She had seen the benefits in her own life and with her students. She needed no convincing. Struggling with issues of intense grief and loss, Sara knew that yogic breathing and poses could help her connect, even for just moments at first, to that place inside of her that is whole and at peace. And personally? Sara says, “Taking care of myself has made me a better teacher and person. I have become more mindful and less critical. I know what is important and what really doesn’t matter. I let go of things and am present more often than not. This calmness reflects in my teaching and radiates to my students. It helps me deal with the many unexpected moments that arise in any given day but especially in the school day.” Can’t ask for much more than that! What did you like about the yoga class? I liked the quiet time without falling asleep. I could use the stretches – they felt great. I would love to know where on the East End I can find an inexpensive yoga class. Yoga on the Square - $30 for 30 days for new students. Relaxation techniques – breathing with students. How does one get focused on clearing their mind to become completely relaxed? This comes from practicing over and over – usually bringing yourself back to your breath when you realize that you are thinking or distracted. I liked the four-pose sequence. The good news is that relaxation is a skill that gets easier with practice over time. Yes, you can actually get good at doing “nothing”. Checking in with yourself a few minutes daily and practicing simple movement and breathing will help your body and mind to unwind. * Importance of awareness breathing. Mar 6 & 28, April 11 & 25, May 15 & 23. Closing my eyes and not thinking about anything. Why does one side of my body balance better than the other? This is typical for most of us. Now that you have noticed this, you can decide if it is a problem that needs addressing or sometimes just noticing is the “fix”. Sensitivity to all body structures / experience. Where / when is the new people? I liked the mood-elevating four movements. I can use the breathing techniques to help with difficulty getting to sleep. Is there a place you teach this regularly (weekly)? The breathing with the body stretching. How do you pace yourself when you go slower? Listen to your body – what is your pain-free range-of–motion, are you breathing smoothly? Do less and be aware of the discipline it takes to go slowly. Hips one way, head the other. What kind of poses can I do to relieve colon pain? The challenge, poses, four-part movement. Slow breathing and relaxing/resting the mind. Why did it seem that my heart rate increased when I was supposed to be relaxed? Initially, this sometimes happens. Slowing down at first can be exhausting and it can make you feel anxious (because of all the things you are not doing). However, with practice and repetition (simple movement and breathing), you will notice your heart rate drop. Can you come every week? No, but you can come to me or you could use my DVD – it’s called Absolute Beginner Yoga. I liked the breathing and relaxation. Enjoyed the breathing and relaxation. Will attempt to use breathing techniques to be calmer and quieter during the day. Rocking side to side on my lower back. What are the different variations of yoga in relation to stress release? If you mean styles of yoga – there are many and they are all branches of the same tree. Any style of yoga done mindfully and with attention to the breath should reduce one’s stress. Learning the moves to do at home. I liked the movement at the beginning. Can use for self: child’s pose. Calm and my heart beat. Why only breathing through the nose? There are many reasons to breathe through the nose, including the nasal hairs actually filter the air you are breathing and act as a first line of defense. Nasal breathing is an optimal, more efficient way to breathe. You get a better exchange of oxygen to CO2. What is yoga? As a complete philosophical system, yoga can be traced to practices arising in the Indus Valley more than 5000 years ago (Danino, 1999). Yoga, as it is most often practiced in the United States, is a system of mind-body techniques that includes physical postures (asanas, or body positions), conscious breathing, and deep relaxation. The core aims of yoga are increased strength, flexibility and balance for the body and the mind. Aside from using the practice for physical fitness, people use yoga stretching, breathing and meditation to prevent or combat poor self-esteem, depression, attention problems, anger, anxiety, and stress. Yoga has also been used to increase focus, awareness, happiness, connectedness, confidence, and academic achievement. Yoga is not a religion. The practice of yoga does not interfere with an expression or practice of any religious belief. Yoga is a form of mindfulness practice, or self- awareness. Mindfulness as described by Jon Kabat-Zinn (2003), is ‘‘the awareness that emerges through paying attention on purpose, in the present moment, and non-judgmentally to the unfolding of experience’’ (p. 145). Mindfulness is sometimes used to mean a sitting meditation practice and is positioned by some as being distinctly different from yoga. However, we recognize school yoga as involving mindfulness, though not exclusively the same as traditional practices of meditation. Why use yoga in schools? Research on special and mainstream populations suggests that yoga and meditation can decrease school behavior referrals (Marie et al.,2008; Walker et al., 2004), increase “time-on-task”(Peck et al., 2005), and improve academic performance by reducing stress (Beets & Mitchell, 2010; Kauts & Sharma, 2009). In a recent meta-analysis of research studies, investigators at the University of Maryland’s School of Nursing found that “yoga may be as effective or better than exercise at improving a variety of health- related outcome measures” (Ross & Thomas, 2010, p. 10). However, unlike other sports and fitness systems that do, of course, also improve mental health, the mind-body techniques of yoga, used in schools, have consisted of gentle, non-competitive self-care practices of physical, emotional and psychological wellness. Brain science clearly validates movement as a critical part of learning and explodes the stereotype that gym class is just about “blowing off steam”. According to “brain-based” educator, Eric Jensen (2005), "[t]oday, the evidence has become a groundswell, and most neuroscientists agree that movement and cognition are powerfully connected" (p. 61). Harvard neuroscientist, Sat Bir Khalsa, thinks that getting children to practice yoga before adolescence could prepare them to combat stress which would reduce the incidence of “life-style related diseases like diabetes, hypertension and obesity” (Sexton, 2010, p. 106). According to Khalsa, people in the United States should think of yoga as a tool of “mind-body hygiene”, something we should use “as often as a toothbrush” (Barrett, 2012, p. 77). The School Yoga Movement. The health and wellness needs of school children are currently a focus of school reform and are written into federal and state policies and standards that address the following goals: educating the whole child; social-emotional learning; obesity prevention; stress reduction; and anti- bullying/character-building programs (Hyde, 2012). The movement to introduce yoga and other mind-body techniques into schools is, in part, a response to help achieve these goals. The scope of the school yoga movement is hard to describe because yoga teachers and organizations that offer school programs lack central coordination. There is no national or state-level curriculum for school yoga, yet we have been able to identify significant “parent” organizations which have distributed their curriculum in some form or another to schools via local yoga educators or school staff who have received training in a specific curriculum model. These organizations include Yoga Ed, Yoga Kids International, Radiant Child Yoga, Yoga for the Special Child, YogaFitKids!, Yoga Playgrounds, Core Yoga in Schools, Yoga for Classrooms, Niroga’s Transformational Life Skills and Yoga Calm. The International Association of School Yoga and Mindfulness (IASYM) is “a translational science think-tank; a consortium comprised of scholars, clinicians, and the contingent authority on school-based yoga and mindfulness, the founders of school-based Yoga, and various derivative programs (K. Carpenter, personal communication, December 15, 2010) IASYM exists as a response to bringing some of the above organizations to a common table of school yoga. Survey data collected by IASYM indicates that there are over 1000 schools with some level of yoga and mindfulness programs and over 25,000 professionals trained to offer some form of yoga or mindfulness in schools. As members of this organization, both of us are witnessing, studying and participating in the school yoga movement in the United States. Yoga In Schools (YIS) is a 501(c)(3) organization incorporated in Pennsylvania by clinical social worker, yoga studio owner and Yoga Ed TM certified trainer, Joanne Spence. YIS provides yoga programming and teacher training to several school districts in Pittsburgh, PA. Joanne regularly speaks to both a national and international audience regarding yoga education. Her presentation and workshop venues include: Carnegie Mellon University Children’s School; University of Pittsburgh School of Education – Falk School Faculty; West Chester University; Kripalu Center; the Pennsylvania Alliance for Health, Physical Education, Recreation and Dance (state) and AAHPERD Conference (national); The Garrison Institute; the National Association of Lab Schools Conference and the National Middle School Association Conference. Curriculum. In 2004, Joanne started searching for a yoga curriculum for classroom use and was very fortunate to find Yoga Ed TM which, even then, had a track record of proven outcomes1 and was aligned with CA Physical Education Standards and national standards for Physical Fitness (Kalish & Guber, 2001). After completing the initial coursework to be certified as a Yoga Ed Instructor and seeing the improvement in her classes, Joanne became a Yoga Ed Trainer which allows her to train Health & Physical Education (HPE) teachers to use the Yoga Ed curriculum. Joanne also trains yoga teachers to teach the Yoga Ed K-8, High-School and Tools for Teachers curricula. Yoga Ed educators must be certified yoga instructors with an interest in working with schools. Andrea received her training from Joanne in 2009 and since then has helped the staff to plan HPE teacher trainings and assessments. Mission and Vision. 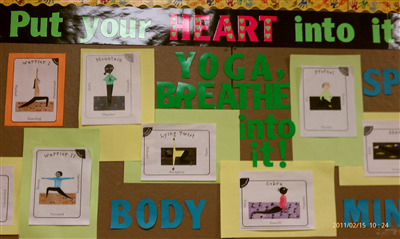 The mission of YIS is to empower students and teachers with yoga-inspired exercises to promote lifetime wellness. Our vision is to make yoga available in all schools so that students and teachers develop body-mind awareness and the ability to nurture their own well-being. We do this by introducing and supporting a non-traditional, non-competitive program of yoga- inspired movement and breathing exercises to children and a set of classroom- ready tools for teachers. To do this, YIS draws from several curricula including the Yoga Ed Curriculum, a standardized model of physical and emotional wellness for teachers and students in grades K-12. The Yoga Ed curriculum is utilized around the country, meets physical education requirements, and has proven to be effective. Our Philosophy: Mindful Movement. Yoga is just one of many mindfulness practices, all of which bring benefits. We are aware of many fine school programs that incorporate mindfulness in the form of seated meditation, focused attention through guided visualizations or mind-body stillness. We do not dispute that teachers and students benefit from moments of quiet rest; we incorporate rest into all of our training programs and curriculum products. However, so many of our teacher-trainees and students tell us that they have trouble being still (physically and mentally) during a mindfulness practice that does not include movement. The addition of movement to any mindfulness practice, we believe, makes that practice accessible to more people. We find benefit in designing professional development that will be likely to result in immediate success for teacher and students. This serves as an incentive and reward for trying something new and combats the pervasive rhetoric of school-related “failure”. Scope. Since its inception, YIS has established a sustainable health and wellness program for at-risk children in the Pittsburgh area. In 2005, YIS was reaching about 300 students. Today, our professional trained staff, working with volunteers, have exposed nearly 20,000 children and 1000 teachers/staff members to varying levels of YIS programming. Schools including the Urban League of Pittsburgh Charter School (East Liberty), Pittsburgh Urban Christian School (Wilkinsburg), Western PA School for the Deaf (Edgewood), the Penn Hills School District, the Helen S. Faison Arts Academy, The Falk School, the Environmental Charter School, Marshall County School District in West Virginia, Woodland Hills School District and Pittsburgh Public Schools have sought and experienced YIS programming as a means of strengthening both the education experience and personal resources in the communities they serve. Many schools are becoming interested and intrigued with yoga programming as part of HPE and the success of the Pittsburgh Public Schools yoga program. Additionally, schools in Cleveland, Chicago, Savannah and Milwaukee have sought out YIS training for their HPE staff and teachers. Joanne continues to advise the yoga recreation program at Schuman Juvenile Detention Center and provides yoga therapy to the patients at Western Psychiatric Institute and Clinic. Researchers there are pursuing the feasibility of a controlled study on the benefits of yoga for teens with bipolar disorder. Media Attention. The success and uniqueness of this programming has also attracted the attention of local and national media outlets in the form of a short article in the “Pittsburgh Tribune Review” and, more recently, a feature article in the “Pittsburgh Post-Gazette”. Joanne was also interviewed on New Hampshire NPR. The links for these articles and interview can be found at www.yogainschools.org/articles-research/. Currently, an independently funded documentary is being filmed about the recent work Joanne and Yoga in Schools have begun at The Shuman Juvenile Detention Center in Allegheny County. The project, funded by The Staunton Farm Foundation, was directly responsible for. the Shuman Center winning a state-wide award for “Most Innovative Programming in a Juvenile Detention Center” for 2010. Funding. Since YIS’s inception in 2005, fundraising efforts have brought in over $300,000 in grant money. The Grable Foundation provided financial support for a successful Pilot Program in 2005. YIS has also worked with Highmark Blue Cross, the Urban League, Western PA School for the Deaf, 21st Century Community Penn Hills Learning Center, Buhl Foundation, Poise Foundation and other private contributors to support program requests from schools. Current funders include the Heinz Endowments, the Sampson Family Foundation and individual donors. Our yoga program employs an integrated train-the-trainer (TTT) model2 that focuses 70% effort on in-service professional development for HPE teachers, 20% on one-on-one consultation with HPE teachers and 10% on supplemental training for classroom teachers. This method contrasts with freestanding models of direct yoga instruction for youth in after- or outside-of- school programs. Train- the-trainer is a preferred model of professional development in many disciplines. It is based on principles of adult learning theory (e.g. teaching others is the best way to retain information) and “diffusion of innovation”, which explains how ideas are communicated through social networks (Rogers, 1995/1962). To extend the influence of our yoga educators, HPE teachers are the focus of four to five in-service trainings per school year. These teachers receive customized presentations, workshops, curriculum materials and equipment that introduce them to yoga practice, pedagogy and instructional techniques. The HPE teachers then include yoga activities in their classes with students as either a stand-alone unit or a modification of existing activities (e.g. swimming, weight- training, basketball, gymnastics). Each HPE teacher receives monthly classroom visits from one YIS yoga educator, which include a professional observation, feedback and suggestions and opportunities to conference on the observed lessons. In this way, HPE teachers can become “trainers” for their students and colleagues. This may mean that HPE teachers deliver in-service training to other staff or become in-house curriculum experts and program developers. To increase saturation of yoga learning throughout the school and district, this training model may be paired with ancillary workshops for classroom teachers and other staff in the use of yoga techniques (Mind-Body Tools for Teachers), and/or adult yoga classes for the specific benefit of teachers and staff. We adopted a train-the-trainer model after realizing that, unless our programs were financially sustainable, there was little chance of attracting on-going funding. We also realized early on that HPE teacher buy-in would be critical to the success of this model. A few early professional development sessions with HPE teachers confirmed that, while many showed initial skepticism and even surprise that the students would like yoga, they soon discovered that even a short, simple yoga practice was not only doable but supported their own health and well-being as teachers.  Resource Maximization: The train-the-trainer model has allowed for exponential growth. We are able to extend our reach to all students in the district by training all of the HPE teachers; these teachers are then available as in-house yoga educators for other staff/ future students. Programs that use yoga teachers to teach students yoga as part of their school day or in after school programs report the same kind and quality of results that we have produced, but cannot extend the scope of their program as quickly and efficiently as YIS does. We admit that efficiency is not a primary concern of yoga teaching in general, but it is a practical concern for schools with finite resources: money and time. 2 Though we think that “educate the educator” (a term we credit to Kelly Skeff, MD, PhD at the Stanford School of Medicine) is a better descriptor of our intentions and procedures.  Whole School Program: The YIS training model is designed as Professional Development for HPE teachers that has the flexibility to extend training to classroom teachers and other school staff. By offering Mind-Body Tools for Teachers (MBTT) workshops (Appendix A), as we are currently doing at Woodland Hills Schools District, the instructional team can reach all of the non-HPE teachers and staff – including behavioral specialists. In this way, the entire school community gets to learn yoga; everyone is working on the same project.  Increased Likelihood of Sustainability: Training school personnel to support continuous instruction and support yoga programs develops internal capacity (skills, knowledge, confidence), which increases sustainability after the completion of the formal project. Our model plans around a two-year training and customized support program. It focuses on teacher buy-in and facilitates district-wide communication among teacher, administration and other staff. As program director and lead instructor, Joanne meets regularly with curriculum leaders and administrators to increase the likelihood that YIS programs will run smoothly. At the same time, the instruction team is small enough to be flexible and responsive to the sometimes stressful and always changing environments of public schools. The largest district served by YIS, Pittsburgh Public Schools (PPS), participated in YIS’s Physical Education Teacher Professional Development program from 2009-2011. PPS is the second largest district in the state, with approximately 26,000 students in 64 schools. The district’s population is predominantly urban and majority African American. Under a rigorous, proficiency-focused curriculum, PPS met annual yearly progress targets twice in the past three years, moving the district into the category of “making progress” under No Child Left Behind. Continuing to raise test scores is an ever-present concern for the district and drives most reform initiatives and professional development efforts. The stated purpose of our partnership with PPS was to integrate yoga into the Health and Physical Education (HPE) curriculum district-wide by training all (or most) of the HPE teachers in yoga instruction. Specific goals included giving teachers tools to reduce stress and to improve student behaviors. The former Executive Director for HPE at PPS, Sara Martin, reached out to YIS in 2006 when internal reform was occurring in the district. She believed that more lifetime activities, in addition to traditional HPE, were needed. She saw yoga as a way to help teachers relax and reflect. She initially envisioned yoga as a whole school morning or recess activity and as a normal part of the school day (S. Martin, personal communication, Mar 4, 2012). Martin communicated her vision to various foundations’ liaisons, who then directed her to Joanne. The ultimate strategy was to create a school yoga program that would encourage a positive change in children’s social and psychological development as well as improve their flexibility, balance and relaxation. Participants. During the 2009-2010 and 2010-2011 school years, 74 Health and Physical Education (HPE) teachers throughout the district were invited to participate3 in this 100% externally funded professional development program. Participants learned specific yoga techniques from the Yoga Ed Sportime K-8 curriculums along with teaching strategies for implementing the curriculum into their particular teaching level and context. Participants received a class set of standard yoga equipment (mats and eye pillows) and age-appropriate music at the start of the program. All teachers were encouraged to implement the yoga trainings into their existing HPE classes. Procedures. Dr. Andrea Hyde provided external evaluation and assistance in data analysis as well as reports to the project’s funders. Additionally, Joanne hired part-time yoga teachers - who were also Yoga Ed trained and who had considerable experience working with children - to support and observe the teachers in their classrooms on a monthly basis. Two separate groups of HPE teachers (30 in 2009-2010 and 44 in 2010-2011) received yoga tools instruction and curriculum implementation training targeted to specific grade levels and special needs, crafted by professional yoga educators. Each HPE teacher received 20 total hours (two full days and two half days) of in-service trainings. They also received an average of 22 hours of individualized on-site and email support from one member of the instructional team. Professional yoga educators visited every school where YIS had trained an HPE teacher. In the course of this work, the yoga educators became personally acquainted with the program participants/HPE teachers as they observed them and conversed with them in their practice environments. This not only provided opportunities for respondent validation, but these monthly site visits became vehicles for specific coaching and personal development. In addition to supporting teachers in their practice, the yoga educators gave written and verbal feedback and evaluations to teachers, provided additional classroom and fitness area resources and bestowed personal affirmations of work well done. 3 Dr. Jerry Lippert, then Director of Curriculum Design and Professional Development, connected YIS with HPE district leaders, Megan Perfetti and Cara McKenna. Methodology. The training project was evaluated for its impact on participants, their schools and students following a “generic approach” to qualitative inquiry (Lichtman, 2009; Merriam, 2002). This qualitative case study/program evaluation did not have research questions from the onset, nor was it meant to be replicable. But perhaps it could generate ideas for inquiry around similar programs. As is typical of inquiry informed by the spirit of grounded theory (Glaser & Strauss, 1967, minus conformity to Glasser’s original coding paradigm), we made no philosophical assumptions beyond believing that participants would be the best, most credible sources of their own experiences; we stayed curious about what might be happening during the training experiences. We wanted participants to reflect on, and then change, their own plans for implementing what they would be learning. Conforming to the axiology and ethical responsibility of non-positivist, qualitative researchers (Creswell, 1994; Rabinow & Sullivan, 1979), we declare our bias as favoring the proliferation of yoga practice among children and their communities and position ourselves as advocates for teacher autonomy and professionalization. Collection of Data. We collected data via participant self-report questionnaires, field observations, and conversations with participants and engagement with other school personnel and students. Individual implementation plans (what participants hoped to do with the skills and concepts that they were learning) and self-assessment data (how well their plans “worked”) were solicited from participants via questionnaires on nine occasions: four during 2009-2010 and five during 2010-2011. Dr. Hyde checked the yoga educators’ field notes (Appendix B) against successive iterations of the participants’ self-reported data and corroborated details from observations and note- taking during the final teacher trainings of Year 1 and Year 2. We were charged by our funders with reporting on the benefits of our training to participants and their students and the frequency of participants’ use of the specific tools that we taught. Because it was a concern for the district, we also decided to ask participants if they thought the yoga tools they were implementing could address the PA Academic Standards for Health, Safety and Physical Education. Of the 74 total participants, 28 HPE teachers completed all assessments (action plans). Data collected from these participants was used to inform the observations of the yoga educators who worked closely with each participant in their schools and classrooms. The data was grouped by participant and treated as mini-case studies. In addition to what is provided below, the results have also been conveyed, narratively, as individual Participant Portraits (Lawrence- Lightfoot & Hoffman Davis, 1997) (see Appendix C). An additional 31 HPE teachers completed at least two assessments; the initial and one other mid-point assessment. Small changes were noted between the two, reflecting change to the participant’s plan, an outcome or new learning. An additional 15 HPE teachers completed only one assessment, typically, the initial assessment. All of the collected information helped to shape the direction of the training and in-school support as reports were read by the yoga instructional team after each collection period. Whenever possible, attempts were made to provide participants with customized, individualized, training and support. For example, at one of the high schools, access to the building was denied to all external programs after a stressful conversion of the school’s administration. Joanne approached the principal directly with an offer of yoga classes for her and her staff to better manage their stress and improve morale. The two decided to schedule seven bi-weekly yoga classes, specifically for teacher self-care. Approximately 13,838 students were served via all 74 participants.  During the 2009-2010 school year, participants taught yoga an average of 2.7 times per week to an average class size of 24 students. Together they served approximately 4617 students.  During the 2010-2011 school year, participants taught yoga an average of 2.6 times per week to an average class size of 31 students. The PA Academic Standard for Health, Safety and Physical Education that participants most often selected as being addressed through teaching yoga was A. Identify and engage in physical activities that promote physical fitness and health. However, most participants (72%) described yoga tools as meeting every standard. Participants noted their most frequent challenges as finding a way to clean the mats and other equipment between use, the obesity or fitness level of students and needing more time with their students. Summary. These results indicate that participants experienced both positive personal change and improvement in their professional practice as a result of participating in the yoga-training program. Participants learned to make time for themselves, which directly benefitted their students and their teaching practice. For many PE teachers, the experience of this year-long training program was the first time in many years that they had received specific, professional instructional feedback and had felt recognized and valued for their important work. Many are working under very challenging circumstances, yet they perform their jobs with amazing skill, compassion and effectiveness. In school year 2011-2012, YIS began a two-year partnership with Woodland Hills School District, a small, urban district (nearly 4000 students and 215 teachers) which includes some of the east-end communities of Pittsburgh. In addition to evaluating the effectiveness of our HPE training program, we plan to focus on how well the practice of yoga among students and the use of Mind-Body Tools by HPE teachers, classroom teachers and other school staff may improve the behavioral climate of the district. Preliminary findings suggest that HPE teachers have been incorporating yoga into their students’ favorite sports and attracting hard-to-motivate students into active play. Meanwhile, classroom teachers are using yoga to calm their students and reduce stress (including their own) before taking state tests. Barrett, J. (2010). Healing power of yoga. Yoga Journal (228), 74-77; 119-123. Beets, M. W., & Mitchell, E. (2010). Effects of yoga on stress, depression, and health-related quality of life in a nonclinical, bi-ethnic sample of adolescents: A pilot study. Hispanic Health Care International, 8, 47. Benson, H., et.al. (2000). Academic performance among middle school students after an exposure to a relaxation response curriculum. Journal of Research and Development in Education, 30 (3), 156-165. Creswell, J. (1994). Research design: Qualitative and quantitative approaches. London: Sage. Hyde, A. (2012). The Yoga in Schools Movement: Using Standards for Educating the Whole Child and Making Space for Teacher Self-Care in J.A. Gorlewski, B. Porfilio & D.A. Gorlewski (Eds. ), Using Standards and High-Stakes Testing for Yoga in Schools Students: Exploiting Power with Critical Pedagogy. New York: Peter Lang Publishing, Inc.
Kalish, L., & Guber, T. L. (2001). Yoga Ed K-8 program. Los Angeles, California: Yoga Ed. Kauts, A., & Sharma, N. (2009). Effect of yoga on academic performance in relation to stress. International Journal of Yoga, 2 (1): 39-43. Lawrence-Lightfoot, S., & Hoffmann Davis, J. (1997). The art and science of portraiture. San Francisco: Jossey-Bass. Lichtman, M. (2009). Qualitative research in education: A user's guide (2nd ed.). Thousand Oaks, CA: Sage. Merriam, S. (2002). Qualitative research in practice: Examples for discussion and analysis. San Francisco: Jossey-Bass Publishers. Peck, H., Kehle, T., Bray, M., & Theodore, L. (2005). Yoga as an intervention for children with attention problems. School Psychology Review, 34(3), 415-424. Rabinow, P., & Sullivan, W. (Eds.). (1979). Interpretive social science: A reader. Berkeley: University of California Press. Rogers, E. (1995/1962). Diffusion of innovations (Fourth ed.). New York: The Free Press. Sexton, S. (2010). Teach your children well. Yoga Journal (October), 76-78; 105- 108. Walker, H. M., Ramsey, E., & Gresham, F. M. (2004). Heading off disruptive behavior: How early intervention can reduce defiant behavior-and win back teaching time. Washington D.C: American Federation of Teachers. A. What are Mind Body Tools for Teaching? Easy yoga‐based exercises / activities to de‐stress and restore you to your SELF. Yoga Tools support you in being the teacher you want to be. You will increase your own SELF‐CARE & SELF‐AWARENESS. Simple and effective classroom management techniques that improve focus, concentration, behavior and learning readiness. Mind body tools give kids a way to de‐stress, feel good and do their best! Simple, classroom‐friendly activities that anyone can do in 1 – 15 minutes and experience immediate results. No extra space or equipment required. Yoga breathing – connects us to our vitality. Awareness of breath brings the mind into the body and helps us have access to the intelligence of the body. It slows us down and helps us be present; an important condition for self‐regulation, communication and learning. Conscious breathing stimulates the parasympathetic nervous system, which calms the body‐mind, balances the nervous system and increases intellectual and social receptivity and well‐being. Games/Activities – engages the whole brain in creative play and thinking that ignites joy and stimulates the secretion of dopamine, serotonin and epinephrine. These positive chemical messengers build brain cells and improve mood, causing a positive attitude adjustment. Yoga‐like poses/movements ‐ release and dissipate the physiological consequences of the stress response in the body. Poses integrate the mind and body through synchronized breath and movement. Even the most basic of poses fuel and focus the mind, soothe and balance the nervous system, and integrate, calm and energize the body. Doing yoga releases tension and stress, activates coordination and awareness and stimulates circulation. Time‐in ‐ involves students in rest, relaxation, inner listening and reflection. This time for inner focus slows brain waves, allowing the nervous system to recharge and the brain to process and integrate information. Time‐in develops self‐awareness and can lead to more responsible behavior. It also enhances learning, problem solving and a sense of peaceful well‐being. It means shifting your focus and awareness form the external world to the internal one. This time can be spent sitting up or lying down in silence, listening to a visualization or music or just breathing. Contact Joanne Spence joanne@yogaonthesquare.net for more info. Classroom rules and procedures: What are the rules in the classroom? How do the students know the rules? Felicia Lane Savage and Katrina Woodworth with Andrea Hyde, PhD. ---Reponses from HPE teachers at the June 1, 2010 PPS HPE Teacher Training, Carnegie, PA. The participant-researchers who composed this collection of portraits are professional yoga educators Felicia Lane Savage and Katrina Woodworth. During the 2009-2010 school year, they visited every school where Yoga in Schools has trained a Health or Physical Education (HPE) teacher. In the course of this work, Felicia and Katrina became personally acquainted with the program participants/HPE teachers as they observed them and conversed with them in their practice environments. At the end of the year, it seemed appropriate to convey the results of this collaboration as a series of individual portraits (Lawrence-Lightfoot & Hoffmann Davis, 1997). In addition to supporting teachers in their practice, Felicia and Katrina gave written and verbal feedback and evaluations to teachers, provided additional classroom and fitness area resources and bestowed personal affirmations of work well done. Dr. Andrea Hyde, a qualitative researcher and yoga educator who consulted on this project, checked these participant portraits against successive iterations of the participants’ self-reported data and can corroborate details from observations and note taking during the final teacher training. For many PE teachers, the experience of this year-long training program was the first time in many years that they had received specific and professional instructional feedback and have reported feeling recognized and valued for the important work. Many are working under very challenging circumstances and yet they do their jobs with amazing skill, compassion and effectiveness.  Darin Stanard: Darin started off this year with the correct attitude. Last year he was so resistant. In fact, he apologized for being so uncooperative at the HPE teacher in-service the year before. He, as well as a few other teachers, talked during most of the time during their initial training and were unengaged. Darin shared that he needed to make a personal commitment to a fitness regimen to get into better shape. During the school year he has incorporated bicycling into his weekly fitness routine as well as going to a local gym to work-out. He looks healthy and has promised to go “power yogaing” this summer with Felicia. When Felicia visited his gym in the fall he had made several CDs to teach yoga warm-ups as well as cool downs and relaxation music. The students were familiar with doing yoga poses; Felicia could tell that they had practiced. When the students played outside, Darin had them cool-down by doing yoga poses. During Felicia’s follow-up visits during the school year, Darin was consistently doing yoga with the students. What a wonderful change in attitude from ambivalence to full cooperation! Darin even offered to be a Yoga Ed teacher-trainer for other new HPE teachers in the fall.  Kim Franklin: Kim was totally committed to implementing the Yoga Ed curriculum from the beginning of the school year. Kim understood the value of doing “this yoga stuff” with children, though she had no prior experience of yoga either personally or professionally. Kim’s goals were to use yoga in warm up and cool down sections of classes. She specifically wanted to increase strength, flexibility, coordination and relaxation in students. However, Kim teaches at two completely different schools. She teaches kindergarten through fifth grade HPE at Davis Elementary and Baker Elementary schools. Implementation of the yoga curriculum was a challenge at Davis and a joy to behold at the Baker. Baker was a HPE teacher’s dream school. Kim had the full support and cooperation of the staff, parents and students, so Kim enjoyed her time using yoga to warm-up and or cool-down her students. However, at Davis there were many classroom management issues and behavioral distractions. At Davis, Kim had to shift away from practicing yoga on the mats and focus more on centering activities and poses that can be done on their “dots” (assigned seating for warm-ups). The children at Davis have a harder time with following directions and remaining self-controlled during games and activities. Therefore, Kim kept to a minimum of poses to provide greater structure and repetition. The students at Baker are more focused and ready to learn. Kim has been able to use the mats to teach the Baker students many of the yoga curriculum poses. She has also used several yoga games from the curriculum. She periodically has had students rest at the end of class. Students at both schools have had positive responses to the yoga. They have been exposed to stretching and improving their muscular strength in a new way through yoga. Students have learned how to calm down and experience peace in the midst of a hectic day. The yoga activities have helped students learn to center themselves. Kim has been invited by her Principal at Baker to teach yoga to the staff during all staff meetings. This exposed the teachers to the new yoga activities that Kim has been teaching in her classes. The teachers had a positive response and Kim has been asked to lead more often during staff meetings.  Lisa Carson: Initially Lisa was on board with doing yoga with her students. She is a very energetic HPE teacher who is aware that she and her students need more rest, relaxation and rejuvenation in their daily lives. Therefore, she has focused on the more calming aspects of yoga (yoga poses and breathing techniques) as a cool-down to her energetic sports-based curriculum. Felicia witnessed Lisa being more relaxed and at ease with doing yoga and the PE curriculum, in general. This calming focus has also affected how the students behave in their regular education classrooms during academic time. Classroom teachers have shared that the students come back from gym ready to sit still and learn because Lisa has allowed them time to exercise and rest in gym class. At the end of the third quarter, Lisa’s principal decided to discontinue gym because the school’s language arts and math scores were so low. Lisa took this decision in stride and realized that she would have to adapt and do exercise with the students as a de-stressor in the classroom. So, frequently, she did yoga stretches and breathing techniques with the students in their regular education settings. Lisa says that yoga is “a calming and centering tool”. Everyone can do yoga. “For those student who are not athletic, it gives them a chance to be successful [in HPE]”.  Wesley Schaeffer: This year was such a transformative year for Wes. He and his wife have adopted a healthier lifestyle that includes exercising regularly and eating more whole grains, fresh foods and controlling their portion sizes. At the beginning of the school year, Wes was quite skeptical of our yoga curriculum. He truly did not believe that it could make a difference in his or his students’ lives. However, half way through the school year his wife received a very high cholesterol reading so she initiated changes in their home life, and he quickly followed suit. He is truly amazed that these changes in their lifestyle have brought her numbers down considerably. These changes have allowed Wes to be more open to new things such as yoga in gym. He was hesitant at the beginning of the school year but now he gets it. Wes has used yoga poses with his students for “warm ups” and “cool downs”. He also made use of some of the yoga games that we taught him. As he shared with Felicia...”it’s about being educated, about living healthy then taking better care of ourselves”. Wes embodies the Yoga Ed curriculum focus on self-awareness and self-care. He is so very excited to talk about how these changes make him and his wife feel. He is excited to incorporate yoga poses into his classroom (gym) routine because it makes sense to him now.  Gene Sailor: Gene started the school year engaged with the yoga curriculum. However, as the school year unfolded she was feeling overwhelmed and frustrated with all the different aspects of the curriculum that she was responsible for: health, character development, fitness (sports- based skill building) and yoga. She did use yoga as she first stated on her action plan as a cool-down component, however, not as consistently as she planned. Gene also took the initiative to learn more about yoga on her own by watching a video on Yoga for Dummies. Also, Gene teaches HPE at two schools, which is quite challenging. So, during Felicia’s observations/visits she would focus on Gene being aware of her own emotions (She felt frustrated and overwhelmed.). Felicia gave Gene some tips as to how to manage her emotions with breathing techniques, stretching and relaxing (all from the Yoga Ed. curriculum). From Felicia’s observations at the end of the school year, Gene was still feeling these challenges; however, the intensity was lessened by her making some personal changes in how she viewed the situation. In planning for next year, Gene realized that it would be helpful to the students as well as her to do yoga every day. Gene did take advantage of yoga’s relaxation components. She made up stories (visualization exercises) for the students at the end of the class period as they transitioned into academic time.  Drew Reynolds: In the beginning of the school year Drew was negative about yoga because he had some experience with yoga and at the present time he was not able to perform most of what we were doing in the teacher in-services. Drew has been in chronic pain (mostly back pain) for a number of years. As with a lot of folks experiencing chronic pain, he become bitter about their life and sometimes resentful of others who are able to enjoy life. Felicia knew from the beginning that Drew was going to be difficult to reach. And so he was. Drew also taught at two very different schools, which for him makes for a challenging adjustment. The students at Coralville are tougher to motivate than those at Kewanee. At the in-services Drew would make negative comments about yoga. Felicia’s response to him that yoga was about the students being better stewards of their minds and bodies so that hopefully they understand health and wellness in their minds and bodies. A breakthrough came during the fall when PPS had an off day and he and Felicia met at the East End Food Co-op. He witnessed first-hand her interactions with the staff and asked me how long she had shopped there. Well, they connected on that day and Drew has since incorporated yoga into his HPE lessons. He initially was very deliberate in his teaching of the yoga poses at Coralville with his index cards of yoga poses. However, Felicia quickly realized that he had been practicing yoga with the students often, since they knew all the poses. Once his confidence was established at Kewanee he began to introduce yoga to the students at Coralville. The students at Coralville enjoyed the yoga warm-ups he put together and Drew was surprised at their positive response. By the end of the school year Drew wrote that he is “imparting wellness” to his students. That is a monumental transformation.  Sam Milovich: Sam is a very conscientious HPE teacher who truly believes in yoga with his own body and his own children (at home). Sam is health and wellness oriented in his personal life. He bikes to work most of the time. Also, Sam had the honor of teaching at one of the first schools to have YIS teachers to teach his students yoga. So, he had wonderful teachers and he has learned well from them. His class is a joy to observe because he is so much at ease with teaching children yoga infused HPE. He uses yoga to warm-up the students and to cool them down to prepare to transition to academic classes. Classroom teachers who receive the students after Sam’s class have commented to me that they appreciate the calm state that the students are in after gym. But, they do know he works them out. One teacher commented that he (the regular education teacher, not Sam) frequently uses the yoga sticky mats and eye pillows as well during after school programming. He admits to using the eye pillows consistently at the end of the day. According to Sam, “the [Yoga Ed] program best served my students by teaching them the value and importance of rest”.  Madeline Pritchard: Madeline is on board with yoga infused HPE. At the beginning of the school year she made a yoga wall, which has pictures of yoga poses and their names. Also, in her gym she created a yoga poses and breathing techniques “station”. The students have truly learned yoga poses and breathing techniques through her consistent effort and diligence. Madeline has had some health problems, which had her out of school intermittently during this year. However, she has been steadfast and steady in her approach to this new yoga curriculum. In fact, Madeline created her own breathing handout for the students. Madeline has truly taken to the study of yoga. She genuinely understands the relationship between the mental, emotional states and the different poses’ benefits. She has definitely been reading the curriculum. She is one of a few teachers who have spent time reading the curriculum.  Lonnie Baker: Lonnie started out the school year at Silvis Elementary with enthusiasm in learning something new and exciting with the Yoga Ed curriculum. In her action plan at the beginning of the school year, she stated that the students would do yoga as a warm-up and cool-down exercise at lunch/recess and the K-1 graders would do yoga for a whole gym period. Lonnie did in fact do most of what she planned. I witnessed yoga integrated into her HPE class for warm-up or cool-down at the end of her classes. However, during the school year she had a health emergency that she needed to attend to by taking time off from school. She was blessed with having Bella, a certified yoga teacher, on site as a support person. Bella was doing yoga in the classroom with Lonnie’s kindergarten classes throughout the year. She would have them doing yoga stretches right in their classroom. When Lonnie returned she didn’t miss a beat. She continued to use yoga as a warm-up and/or cool-down routine. Also, Lonnie led breathing techniques with the students during their bathroom breaks to keep them focused and on task. Also, Bella’s yoga activities included a lot of yoga poses and relaxation time. Bella was asked by Dr Nichols, the principal, to lead yoga for the 3rd and 4th graders as they took the PSSA test in April. This helped the students to relax and focus more for the test. This activity was such a success the principal is planning to incorporate yoga into their Freedom School summer program. So, between Lonnie and Bella, yoga is a year round activity at Silvis.  Celia Holden: Celia teaches kindergarten through fifth grade at Trinity Elementary School. Celia was unfamiliar with yoga when she first came to the September 2009 Yoga in Schools training. Celia planned to start the school year with a unit from the Yoga Ed curriculum, and then to use yoga as a cool down and transition time activity for the rest of the school year. This would allow her to introduce the elements of the curriculum such as time-in, breathing exercises and relaxation at the end as well as teaching poses to students. Celia actually met and exceeded her goals during Felicia’s observation time with her. Katrina discussed Celia’s initial observations with her after the yoga unit, which was two-fold. She noticed that students that struggled with self-control and focus were slower to catch on to the yoga. Second, she observed that the class as a whole was calmer and ready to go back to their academic classes. After finishing the yoga unit, Celia has continued to use elements of the yoga curriculum in each class by either beginning or ending class with some form of calming yoga - slow yoga postures, a breath and quiet time-in or resting pose. The kids leave her class centered and ready for their next activity. Felicia witnessed her students doing yoga for the whole class period: warm-up sequences with yoga mats, learning of new poses and corrections in alignment, cool down poses and then rest and relaxation with the eye pillows. Sometimes, Celia allows students to pick poses from the yoga bulletin board and lead the class through the pose sequence. The students have enjoyed both the poses and the relaxation time and have had a positive attitude in gym. The whole school community is supportive of yoga. Students have shared yoga poses with parents at home. Parents and other teachers have commented on student’s enthusiasm toward yoga. Celia has led several yoga activities during staff meetings. Teachers are also beginning to implement some yoga activities into their routines. In review of the year, Celia now sees yoga as an essential aspect of her curriculum. Students are learning self- control through calming yoga breathing and centering. She plays music at the end of class, the sound of ocean waves, which and the kids love.  Angelina Kegan: Angelina teaches Kindergarten through fifth grade at Rock Island Elementary. Her initial goals for using the yoga curriculum were to raise student self-awareness and control and to bring fun and creativity to the fitness portion of class. During the initial yoga teacher in-service training, Angelina told the trainers that she had been in pain for the last three years. She decided not to participate during the first day of the two-day training. However, when she went home she was in so much pain that she decided that it wouldn’t do any harm to just participate the next day. After the second day in which she fully participated she was practically pain free. So, on her way home after the in-service she decided to sign up for yoga classes at Amazing Yoga close to her home. Angelina has been a yoga advocate ever since then. By taking yoga classes herself Angelina is learning the correct alignment and able to give corrections to her students. She has experienced an increase in her confidence level with teaching yoga by taking yoga classes. In the Fall, Angelina taught a yoga unit, focusing on six poses. She played the game “Name that Pose” and even invited students to teach and lead others in learning the poses. As she transitioned to a new unit, she kept using yoga in the warm-up and cool-down sections of class. Angelina noted that the poses help students increase muscular endurance and strength while at the same time increasing flexibility. Students enjoyed the challenge of learning the poses and leading one another through them. Angelina thought it added variety to the SPARKTM curriculum. During the second part of the year, Angelina began to teach more breathing exercises and affirmations, encouraging students to learn to center and calm themselves down. She began to implement the mind/body tools in the curriculum during times of transition between classes. Angelina has fully engaged in integrating yoga into her HPE curriculum because of the pain relief she has experienced firsthand. She said that if she is able to spare any of her students from the pain she has endured; her suffering has not been in vain.  Jessica Bui: Jessica teaches gym to kindergarten through third grade at Wilson Elementary School. She was completely new to yoga in September 2009 when she first came to Yoga in Schools training. Jessica’s initial goals were to introduce yoga into her warm-up and cool down routines. She began to teach students poses from the curriculum. Jessica’s goals were to promote stress relief, balance, coordination, strength, and flexibility. She also devised a parent letter to inform parents about the new yoga emphasis in gym. Jessica began the school year using the Yoga Ed curriculum. She was eager and open to learn as much as she could during our teacher in-services. While observing her, Felicia noticed she had a high level of comfort with the yoga curriculum; she seemed to have spent time reading it. Most teachers didn’t seem to have read the curriculum. She and her students were familiar with the yoga poses and a few breathing techniques. In January, Katrina observed Jessica’s class and noted that Jessica had not only taught students several poses such at tree, airplane boat and plank pose, but she had designed an entire class around balance, including games and affirmations. Jessica brings a sense of playfulness and creativity to her classes. Katrina watched as she “wiggled and waggled” with the kindergarteners, got stuck to the floor in the peanut butter and jelly game with first grade and sang “All good things reign down on me” with all her classes. The yoga tools in the curriculum have helped her to manage classroom mood, especially to decelerate classes when they are agitated. The students have enjoyed both the poses and the relaxation times, heading back to class with a sense of readiness and anticipation. Towards the end of the year, Jessica started to share her yoga knowledge with other staff and teachers. She noticed the increased stress during PSSA testing week and was able to use several mind-body exercises with various classes. Jessica has expressed the desire to lead the staff through yoga exercises to help them manage and improve their own stress levels. With the support of her principal, Jessica led the classroom teachers at staff meetings through several yoga poses and breathing techniques. On a personal note, Jessica is hoping to expand her own practice during this summer by finding a local yoga class to attend. Jessica understands that personally she needs to be comfortable with her own body and plans to reduce her weight to become an even more effective teacher.